April 29, 1984 Kevin E.
DOVER – Save for the one who outwitted the rabbit In a road race, turtles rarely have been recognized in literature by anyone other than Dr. Seuss. They’ve recently premiered In the comic book world, however, and in a manner that’s far more lethal than the racing turtle, who, like others of his species. probably would have perished if someone had turned him on his back. The same can’t be said of Leonardo, Michaelangelo, Donatello and Raphael, a fearsome foursome of Teenage Mutant Ninja Turtles more accustomed to knocking enemies on their backs. Conceived in the minds of Peter Laird and Kevin Eastman, the creatures are the heroes of the duo’s first comic book, which will be displayed at a convention May 5 at the Howard Johnson’s Motor Lodge in Portsmouth. Laird and Eastman, two young comic book fanatics who operate an art studio out of their rented Dover house, batted around a number of ideas of lowly creatures-turned-lethal, and settled on the Teenage Mutant Ninja Turtles instead of Guppies From Hell and other candidates either too absurd or not absurd enough to fit Into their plans. Altered in size and mind by a radioactive ooze, the turtles dwell under the streets of New York where they follow the orders of Master Splinter, formerly the pet rat of Hamato Yoshi, a murdered Japanese Ninja. Splinter, who perfected the martial arts by watching his master from a cage, has sworn revenge on the Shredder, who killed Yoshi, and plans to use the turtles to rub out his enemy. What they will do, however, is show off their prowess by trashing an East Side gang known as the Purple Dragons, and the impressed Splinter tells them the time has come to do the same to Shredder. This shell backed quartet then sets after Shredder and stages battle on a rooftop. 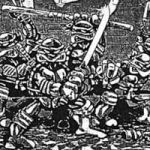 Though Eastman and Laird don’t want the ending revealed, they will say the 40-page comic book is “open-ended” enough for Teenage Mutant Ninja Turtles II, so it’s obvious the foursome live to fight another day, but judging by the turtles’ track record. the same can’t be said for the Shredder. “If there’s enough response, we’ll continue and we’ve already worked up some new ideas for two other books,” says Eastman, sitting under the shadow of a six-foot stack of cardboard boxes, all of which contain copies of Teenage Mutant Ninja Turtles. 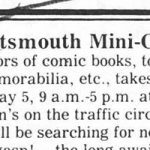 So far, Eastman and Laird have gotten a verbal order for 300 comic books, but they still need an outlet for the 2.700 other copies they published. But comic books have a cult-like following, and a publication favorably reviewed generally gets attention from readers. Laird describes the typical comic book reader as a creative male being between the ages 15 and 35, and often times well-educated. 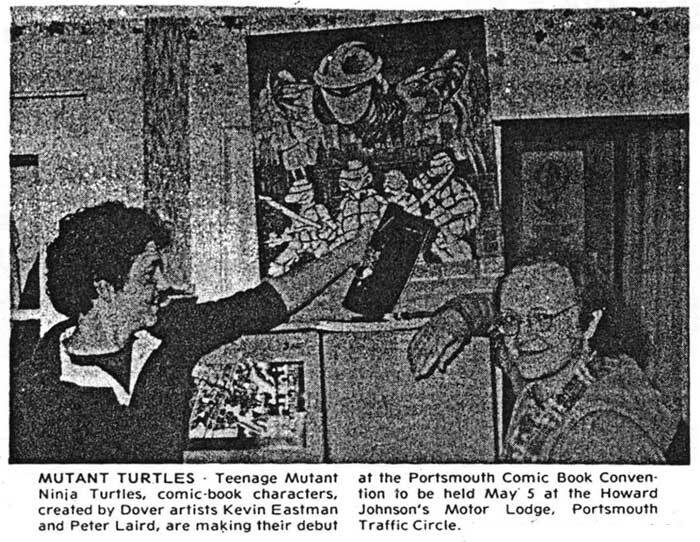 And Laird and Eastman would like nothing better than for a good number of such smart people to attend the Portsmouth comic book convention may 5 and let their minds run wild with the adventures of Teenage Mutant Ninja Turtles.